Canadian hard rockers Thunderbird are releasing their anticipated self-titled third album on Delinquent Records on April 25, 2018. 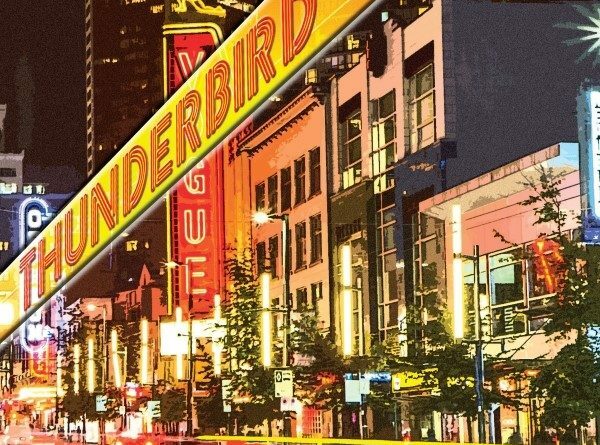 “Thunderbird” was recorded in Vancouver BC, produced by Marc LaFrance and Kelly Stodola and mixed by famed engineer Mike Fraser. Musically, the songs are inspired by classic hard rock. The songs were written during 2016, after the band finished their last album “Heavyweight”. Recording began for a third album late 2016 at Vancouver’s Armoury Studios with famed engineer Mike Fraser (AC/DC, Aerosmith, Van Halen). Sessions continued through the first half of 2017 at several Vancouver studios with other veteran engineers including Ken Burke, Kris Siegers and Mick Dalla-Vee. The finished album was mixed by Mike Fraser at The Armoury and mastered by Adam Ayan (Def Leppard, Foo Fighters, Queen) at Gateway Mastering. The band’s former guitarist Rod ‘Doc’ Coogan was unable to take part this time due to other commitments, and rising young talent Brice Tabish joins Thunderbird on guitar. Rod still makes a welcome appearance with the guitar solo on opening track “Liar (Fool’s Gold)”. Guest musicians on the new album include jazz pianist Chris Gestrin, and a string section on closing track “Vampire” arranged and conducted by film composer Peter Allen. Already a seasoned player on the Canadian scene, Brice tours with ‘metal queen’ Lee Aaron and has recorded with the likes of Andrew Oldham (Rolling Stones). He performs live regularly in the Vancouver area with Las Divas and the John Pippus Band.